I'd planned to drive in the morning of the race. 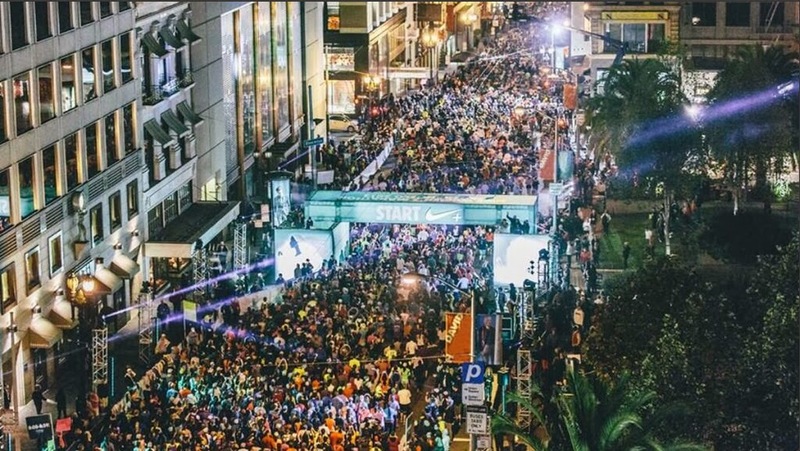 Which is no easy decision given the race begins at 6:30 in the morning and there are 30,000 runners. Add organizers/volunteers/spectators and the massive number of people was intimidating. But when BART (local transit) went on strike I started to panic. 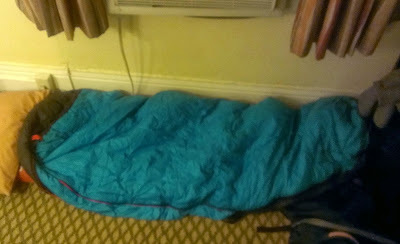 So I reached out to everyone I knew running the race and/or living in San Francisco, and I do mean everyone, and I was lucky enough to have my friend Irene offer me the floor of her hotel room. Whew! 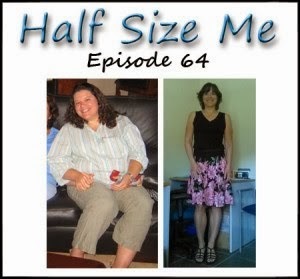 I met Irene some 8 years ago on the Body for Life California chat forum. That was pre-blog even (mine, not hers)! 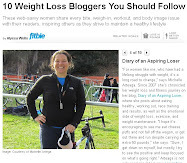 Way back then she invited me to the Muscletank website, which was my entry into online journaling and eventually led to my starting this blog. 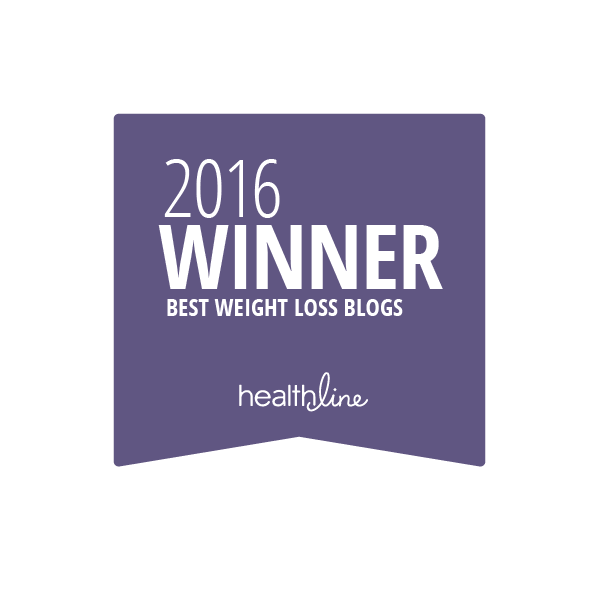 So in a way, I have Irene to thank for this blog. 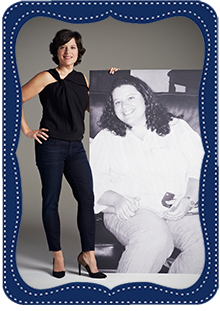 Irene and her husband Michael live in San Diego and despite not being all that far apart, we'd never met, until now. So I happily packed up my sleeping bag and Big Agnes Q-core sleeping pad (that I use for backpacking) along with my gear and drove into the city. The humongous parking garage I'd planned to use said FULL but I managed to find a spot anyway. I have a feeling driving in Sunday morning would have been an unmitigated nightmare! 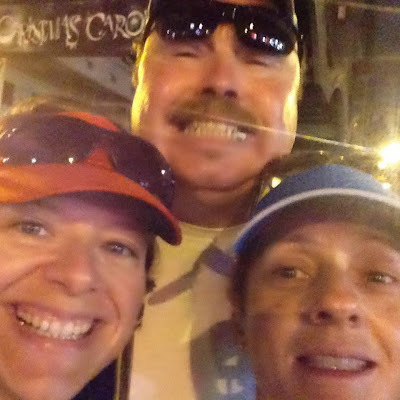 I made my bed, ate two candy bars (a Snickers and a Reeses PB cup, if you must know) over the course of the evening, and chatted with Irene and Michael about all things running and the Nike race. This is her third time running the event so she had lots of tips and experience to share. 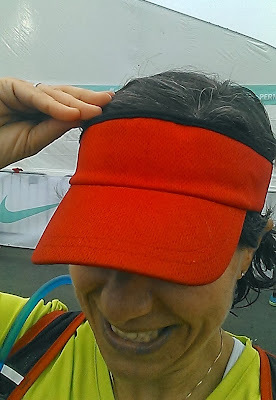 Of course I had my period (what now seems like a race must-have, doh!) but at least the cold I'd gotten mid-week seemed all but gone. My digs for the night. I couldn't have been happier! Check out that round race bib. Not a fan. Some things don't need improving. I felt like I was adding a little preggo bump to my belly. Not sure what time we finally drifted off to sleep but I think it was somewhere around 10:30pm. The alarm went off at 5:30am and we slowly got our butts in gear. 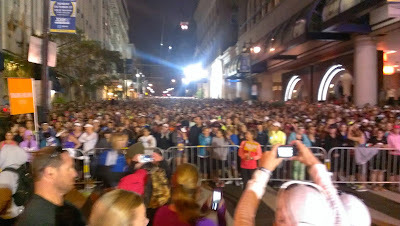 We were literally a few blocks from the start and from the hotel window I watched the masses file by. Race day, it's here! I felt in a strange no-man's-land kind of place. In the three weeks since the SC Triathlon I'd done exactly two training runs, one 8 miler and one 6 miler, and that was IT. No other training. In fact, no other exercise at all aside from a 10 mile hike. I had no idea how this race was going to play out. I'd guessed somewhere between 2.5 - 3 hours and hoped it would be closer to 2.5 hours. 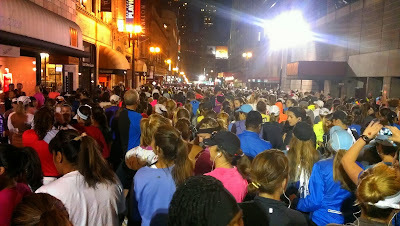 We made our way to our corral (9:00 - 9:59 pace) and I felt like I was at a strange runner/rock concert. The crowd was massive. And yet I was seeing only a small part of it. I took pictures of what I could see of the crowd but there were more than 5 streets parallel to mine filled just like this. Amazing! And a 3-person selfie of Irene, Michael and I. It's still dark and cold outside and we're lining up with 30k people to run 13.1 miles. I think I've officially lost what was left of my mind. But at least I have good company. The race starts at 6:30am and it was maybe 10 minutes later when we were making our way to the starting line. 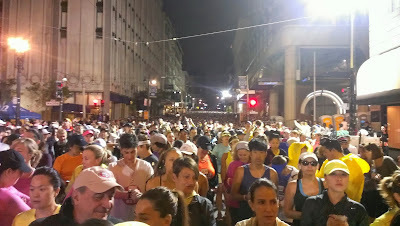 We passed some other "corrals" (read: blocks upon blocks of people) so I snapped a picture. I think this is the 10:00 - 10:59 group but I'm not sure. Imagine blocks and blocks filled like that. And then I saw it, the starting line. 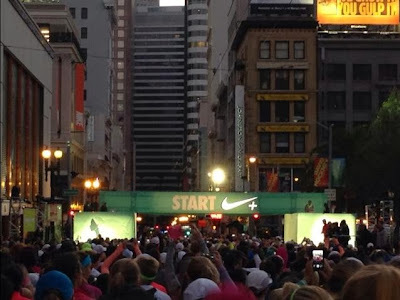 It was still dark out and my memories of the first mile or so are hazy. I had a sweatshirt on that I'd planned to dump, a running skirt, my yellow See Jane Run half-marathon shirt and my Camelbak. The route starts mostly flat then a nice decline as we approach the Embarcadero. I wasn't sure how to pace myself so I decided to just run. Go figure. I was a bit concerned I might hit some kind of a lack-of-training wall around mile 7 or 8 but decided to just deal with it when it happens. My first mile went by in 9:51 (and included that nice bit of decline). Mile 2 was flat and went by in 10:16 minutes. My heart-rate was in the low 150's and at that point I figured heart-rate was the best tool for pacing myself. I know low 150's means I'm not working too hard and that's about how it should be in mile 2. I felt warmed up so I dumped my sweatshirt at a donation box. Even though I'd purchased it at Goodwill for just this purpose, I still felt funny tossing it. Anyway, the start of mile 3 brought a small hill, I tackled that without issue. The real climb came during mile 6, when we started climbing from Crissy Field up toward the GG bridge. I'd had my first ShotBlok just before then. Fortunately I've run this hill a few times in other races and in training runs. The difference is, I always peel off and head over the bridge and this time I just kept going, up, up, up the hill...all in all we climbed for about a mile. One of the longest climbs I've done on foot. We reached the top and you heard sighs of relief and even a few squeals of gratitude. And then wheeeeeee! !, what goes up, must come down, right? Here's the elevation profile. A pic I lifted from Twitter. You go directly from running downhill to bam! Back up for another climb of about 1.5 miles. Did I walk up any of those hills? Hell no I didn't! There were moments when I wanted to stop, moments when I had to ask myself, "you want to walk, but can you run?" and the answer came back, "yes I can!". I slowed, my pace inched up to 11:21 during that first hill, 11:12 during the second, but I never walked. The slow pace was balanced by the downhills, 9:38 and 9:25 for those. Somewhere around mile 8 I also took a picture. I'd gotten my phone out because I heard a text come in and wanted to make sure it wasn't about the kids, who were with a sitter. As if I could do something. Barring an emergency it's not like I could exactly hurry home. Between the hills, the scenery, the funny/inspirational/encouraging signs and banners (one of my faves, "You Look Soooo Skinny!! 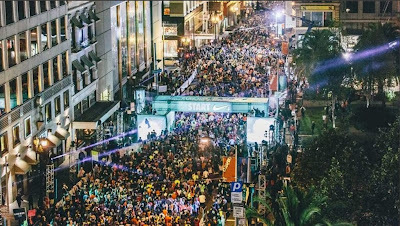 "), the people watching (almost as good as the airport), and the occasional cheering squads the miles seemed to be flying by. I've never had the experience of miles going by like this before. From about mile 7 on I kept thinking, wait, are we at the next mile already? The scenery was a bit hampered by the fog. 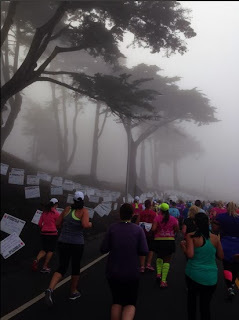 It never really burned off and we couldn't even see the GG bridge, despite running right by it. In fact, it stayed chilly for the entire run, which was fine as long as I was running. After the bigger hills I see mile marker 10. What? Already? I had a second ShotBlok as we moved into GG park for a mild climb. I kept an eye on my heart-rate, and other than when climbing hills, it was fine. And I seemed to be staying roughly in the 10:00 - 10:30 range for pace, which made me happy. I passed a woman who said to her friend, "my entire body hurts," and that led me to do a body-check, I'm in some mild discomfort but really I'm fine. 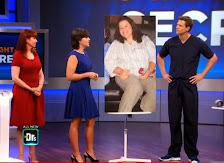 The body check has become a valuable tool when I'm feeling mentally tired. I mentally scan my body from head to toe and most of the time, I'm actually doing pretty good. It's my mind that gets beat. Though in this case, I hardly had time for that to happen, what with the race going by so fast! I did have a mild crampy feelings in my calves, which is practically normal for me. But strangely my left arm kept feeling sore. As if I was holding it stiff, or it had just been let out of a cast. I kept having to shake it out for relief. But other than that and a small blister forming, I felt fine. At mile 12 I had one more ShotBlok (3 in all for the whole race), thinking, "eh, I've hardly had any, why not give myself a final boost." I finished up the last bit of incline and started mile 13, where it's all downhill or flat from there, feeling like a million bucks. I got this! I got this!! I ran the last mile while resting on a cloud - that's how I felt. And then I came around the corner onto The Great Highway to see the ocean, quickly followed by a big blue Finish sign floating over the street. I picked up the pace, and felt a rush of joy as I crossed the finish line. Hallelujah! I never hit a wall, I never walked, I never hurt - I was a happy, happy girl!! A happy, grateful, joyous runner girl. I had a lot of time during that race to think about my life. Things aren't perfect but there's a lot to be thankful for. I will always be grateful for the health and well-being of my kids, my family, my loved ones and for my ability to experience joy and laughter and sadness and tears. The full spectrum of life, I'm alive and feeling it. 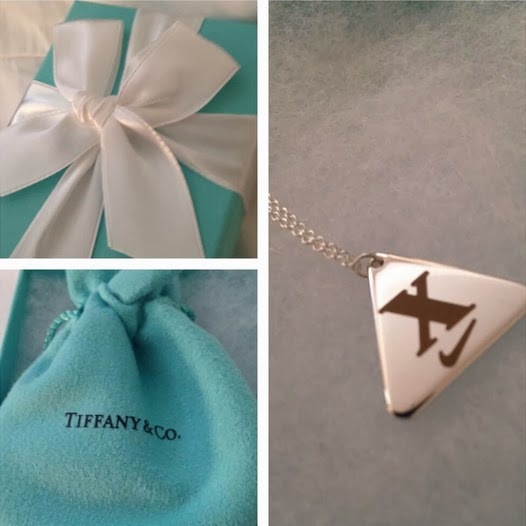 The first thing you get is your Tiffany & Co finisher's necklace. 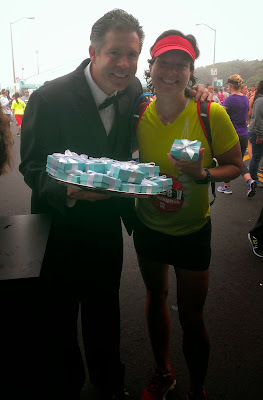 SF Firemen dressed in tuxedos hand out the necklaces. This race knows how to treat a girl. After the necklace there's a line for your t-shirt. Lines, lines and more lines for everything. Tons of people, tons! But it was fairly well managed. After the t-shirt I got a space blanket. This was the first time I ever really needed one. I started to get a chill. My phone wouldn't work due to about a million other people in the area trying to use theirs too so I couldn't track down Michael, who had my change of clothes. I accidentally snapped this picture of me but saved it because...look at my lips! Gee, do I look cold? My lips are so blue! 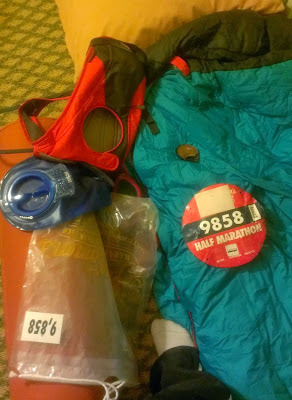 Partly hoping I'd be warmer I went into the gear tent. 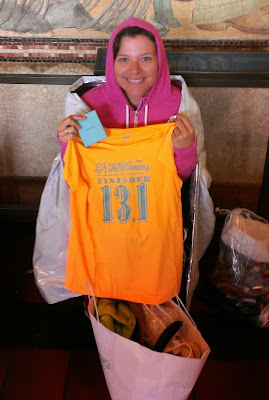 It wasn't warmer but in my post-race haze I bought two shirts and a hat. Smart move, Nike, smart. I put one of them on, a pink long sleeved quarter zip, and kept trying to reach Michael. My whole body started to shiver and I seriously considered going to the medical tent, hoping it would be warm or have blankets or something. For the first time ever I could have cared less about a post-race massage. It's too cold to stand in line for that! I happened upon the results computer and looked up my official time, 2:14:40. Woot! Guess I under-estimated my little runner legs. And heart. What I really think is neat is my age group, 620th place out of 2983. And I finished 5997th out of 26,404 who finished the half-marathon. Not bad for a late bloomer. Finally, about an hour after I finished I was able to get a call out to Michael and track he and Irene down. I could barely talk at that point, and I all I could think about was putting on my sweat pants. I'm wearing my space blanket backwards - doh! Irene was happy with her time and we chatted about the race a bit before I had to leave to meet up with my tri runner girls. I found a corner inside of the lobby area and waited. Before too long Amy arrived and I told her how cold I felt. She gave me her sweatshirt (thank you Amy!!). I took off the shirt I ran in (it was still wet) and layered up all the clothes I had on top of that. It was another hour before the chill started to pass. I swapped that shirt for a red one, apparently they'd run out of these orange-ish ones but I like red better so that worked out nicely. Cool finisher's shirt, right? I wore it proudly today. A little wait longer and all the ladies from tri club had arrived for brunch. We sat outside but by this time I was ok, although I never took my space blanket off. I started my meal with a Bailey's and coffee. I could've drank 6 of those. And ordered corn beef hash and eggs for breakfast. I really wanted french toast but that wasn't on the menu. 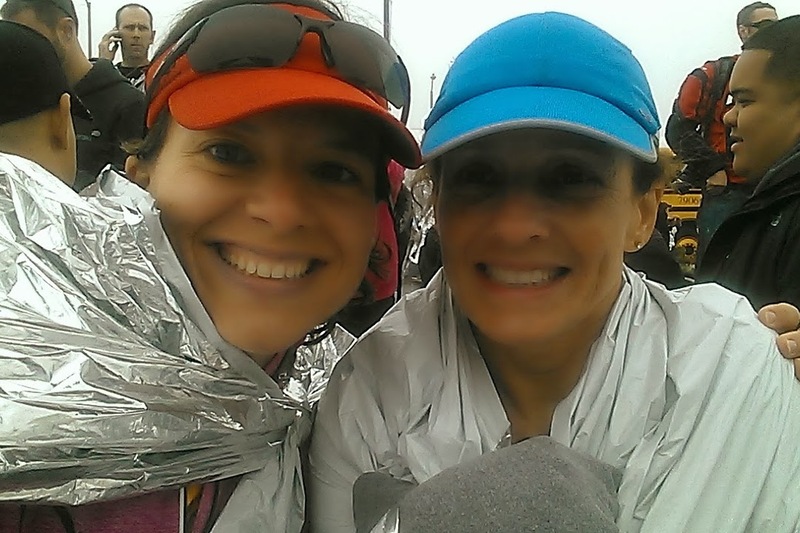 We went over the race and the biggest thing was how different their experience was from mine. They all started together in the 11:00 - 11:59 corral and they said they spent the entire race having to navigate around walkers. 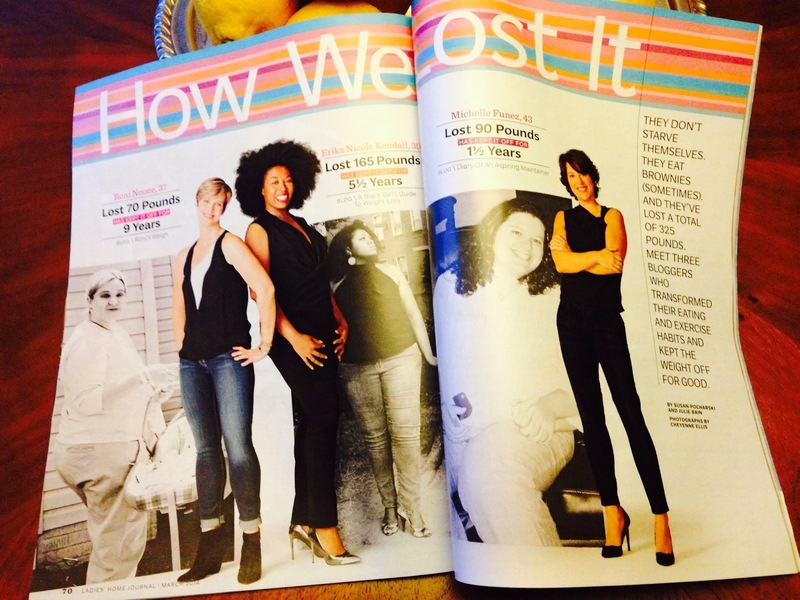 Their description sounded downright horrible and one woman said she'd never do the race again. I told her to do it but pick a higher pace corral next time because while I had to maneuver around a few walkers here and there, it was nothing compared to what they described, "like trying to run a race down main street at Disneyland." After breakfast I made my way back to the hotel to meet up with Irene and Michael. Packed my gear, congratulatory hugs all around, and then finally in my car. Whew, that's a long day! If it weren't for the cold I imagine I'd have felt a million times better, but I still felt pretty damn good about the whole thing. And my time, 2:14:40 - holy surprise! That's only 10 minutes slower than my PR. So I felt pretty good today. My left knee feels a bit tweaked, like it can't go straight when I walk, it's weird. I don't usually have knee issues and it didn't bother me at all during the race. I'm going to just rest it for a few days and hope it goes back to normal. And then my plan is to get back to the gym. It's been forever since I've had any normal gym routine. I need to get my muscles back. And lean out some. I've been eating like a race horse. And while I am a racer, I'm not a horse. Time to scale back, tighten up, get stronger. Yours truly has some big things on the horizon and needs to look her best to represent the maintainers of the world! Or at least of the blogosphere. Anyway, back to the race. I loved this race. Could you tell? And from now on I'm doing longer tapers. Two weeks minimum. This was an amazing experience. I sure hope I get in next year. Heck, I might even take on the full 26.2 next year. Tiffany and Co ?... awesome. Yes, you have earned it. Way to go! 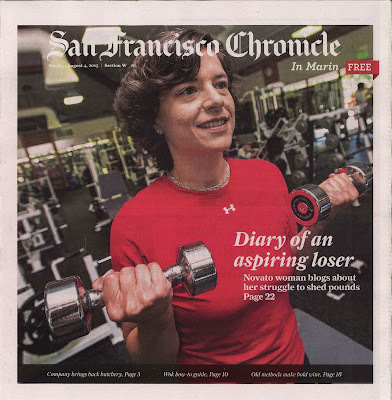 Keep us in mind next time you need a crash pad in SF! glad you had a great time! and wow! might tackle the full next year! i have nothing but faith that you can do it if you want to. you're in awesome shape and you're determined. 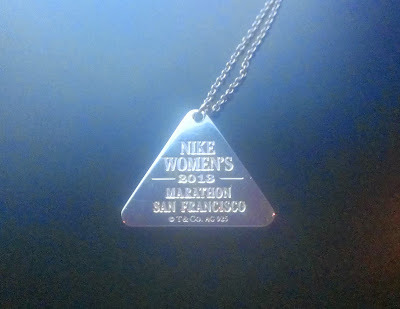 i wish Nike did one of the Women's marathons in Austin, TX. i should check, tho, they might do one in Dallas. 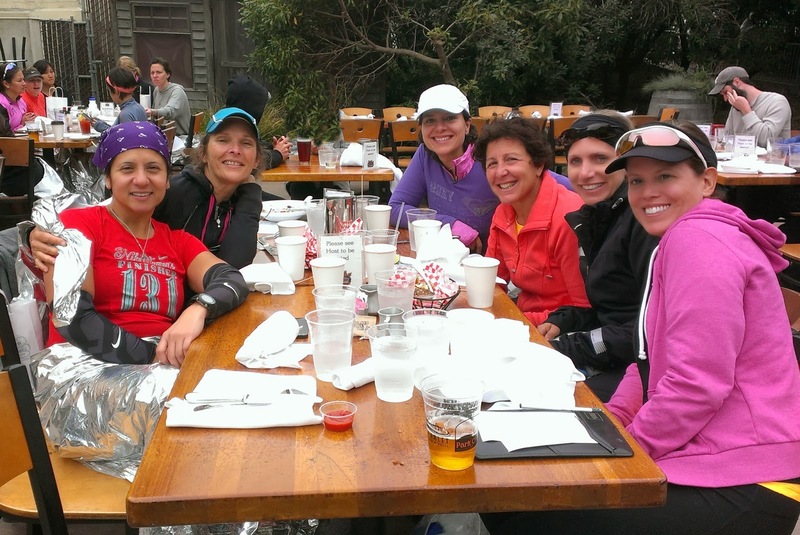 Looks like a great run and lots of fun! My 2007 Nike experience seemed similar to your friends. 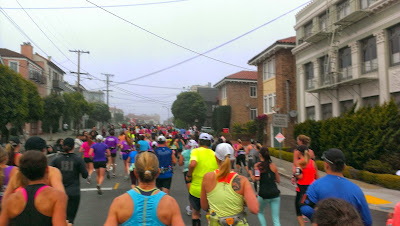 Being stuck behind walkers really messed up my race plan. I had an OK race but it wasn't as stellar as I hoped it would be. Starting in a faster corral makes a HUGE difference! This year's race was the best experience out of the three times I've done it, and there are several factors that I have learned from. I'm so happy that we finally met in person. I hope our paths do cross a lot sooner than 8 years. ;) Wishing you all the best in your future endeavors! 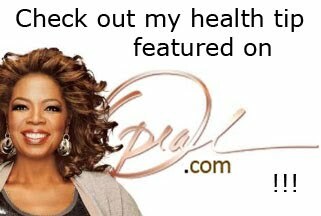 Now I'm going to take a look at my blog and, perhaps, update it.